Vanessa is the middle child. She has two sisters, Adrienne is the oldest and Marie is the youngest. They're very different from each other. Marie is deeply religious, Adrienne is gorgeous and confident and Vanessa is a gifted piano player. She doesn't have much time to play though, because the three girls have to accompany their mother to Mexico where she gets a type of treatment for leukemia that is forbidden in the United States. The sisters spend hours in the garden of the clinic. Waiting is something that has become a large part of their lives. Vanessa is such a sweet girl. She's caring, talented and easy to get along with. Adrienne is bold and fierce, she says whatever she wants to say. Marie is cute and athletic and she's obsessed with saints. Vanessa is the strong one of the three, which means she has to shoulder more responsibility and a lot more heartache. It was interesting to watch her personal growth. She's a child at first, but she has to grow up quickly and becomes a wise young woman instead. Her family has a lot of problems and they often moved me to tears. Tell Me Something Real is a beautiful tragic story with impressive main characters. I love stories about sisters and Tell Me Something Real is a great one. Calla Devlin has written a fantastic captivating story. It's honest and emotionally raw and there are many surprising developments. I liked the fast pace and her descriptive tone of voice gripped me from the start. She knows how to write about feelings. Marie is perceptive, which makes the portrayal of them deep and meaningful. 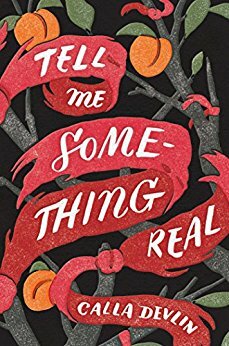 Tell Me Something Real is an amazing shocking story, it's unexpected and stunning. I highly recommend this impressive book. Sometimes I need a tragic story with deep emotion to fall into, you know? I think I would like reading Tell Me Something Real. This sounds like such a sad story. The pressure the poor girls must be under. Interesting to know what the treAtment is. A review that has made me very interested in the book also slime a great book for eldest daughter. Is it a sad story? I have a hard time reading stories that make me sad. The title is catchy as well. This book sounds very good. I also like books about sisters, especially when they are so different! Sounds great. This kind of book topics are always interesting. I would love to read about. Babcock girls as they support each other through a terrible family revelation. It's always interesting to see how members of the same family react so differently when faced with tragedy or loss. Sounds like Ms. Devlin has hit the nail on the head with this one. I love the title. I wonder how it plays into the story. 1) I couldn't help it: The chorus/hook of Chaka Khan's "Tell Me Somethin Good" kind of got stuck in my head almost at once. 2) With regards to this book's cover, I see an uncanny resemblance to that of Ann Patchett's "Commonwealth." When looked at side-by-side, I think it's quite striking. But, back to the book/review. I tend to really enjoy books that delve into the relationships between individuals. And with all of the waiting that the sisters must do, along with their various developmental stages, I would imagine that this book would make for quite the fascinating read.